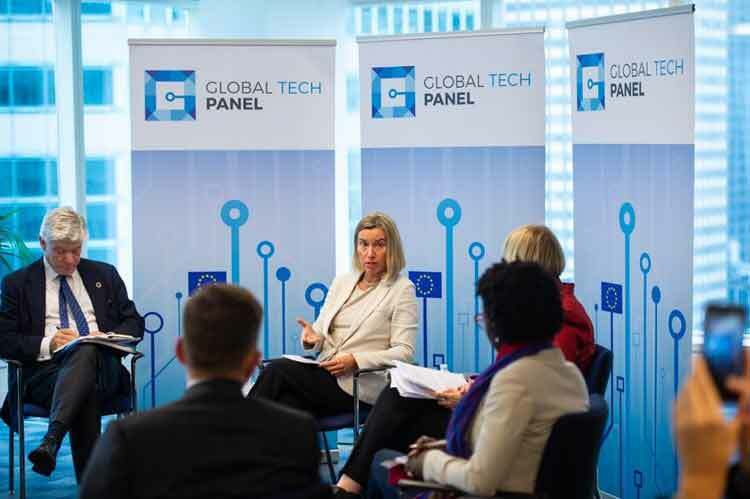 Launched by High Representative Mogherini, the #GlobalTechPanel brings together leaders from the tech industry, the world of investment, and civil society. 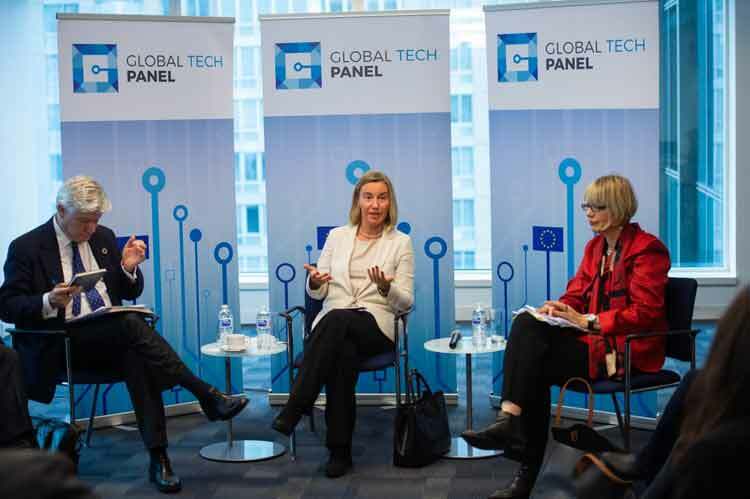 The aim of the Global Tech Panel is to foster new types of cooperation between diplomacy and technology to address challenges and threats but also to make innovation a true force for good in an increasingly more complex and connected world. 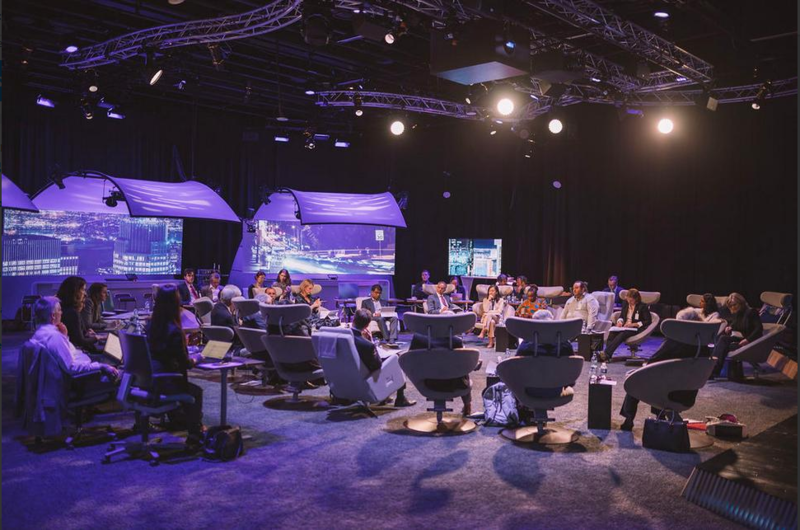 The Global Tech Panel is a forum for the open discussion and practical development of innovative solutions; it focuses specifically on the nexus between tech and common foreign and security policy. 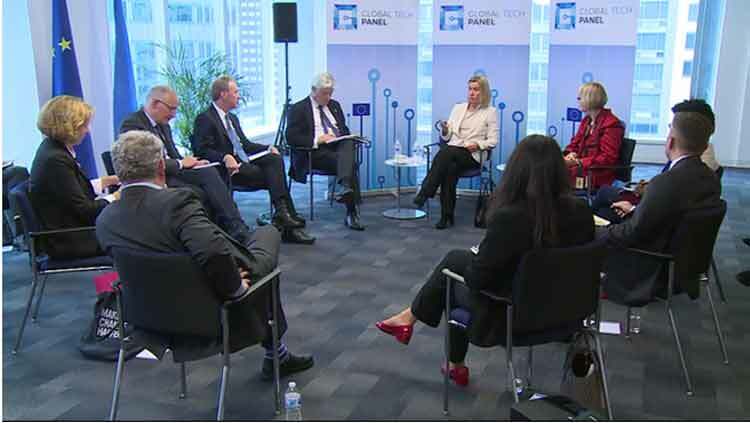 The ambition is to build a common understanding of the opportunities and challenges of the digital age, presenting practical suggestions to be shared with policy-makers at top level, all around the world. 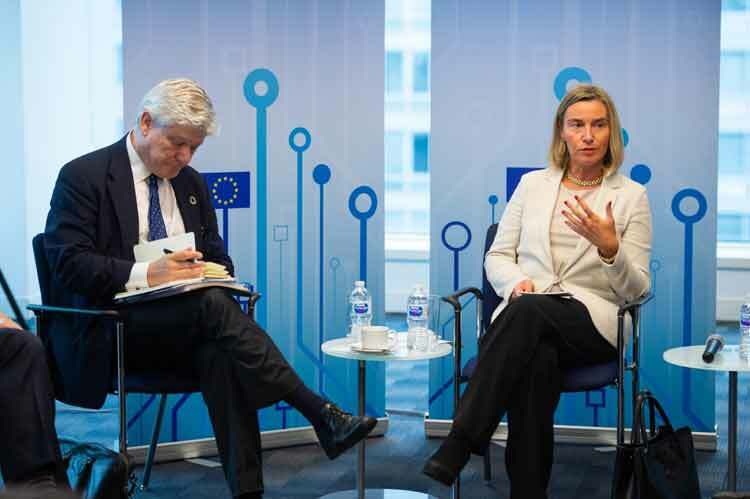 It also seeks to develop and coordinate concrete initiatives that the EU, tech companies, other tech stakeholders and partners can implement in coalition. 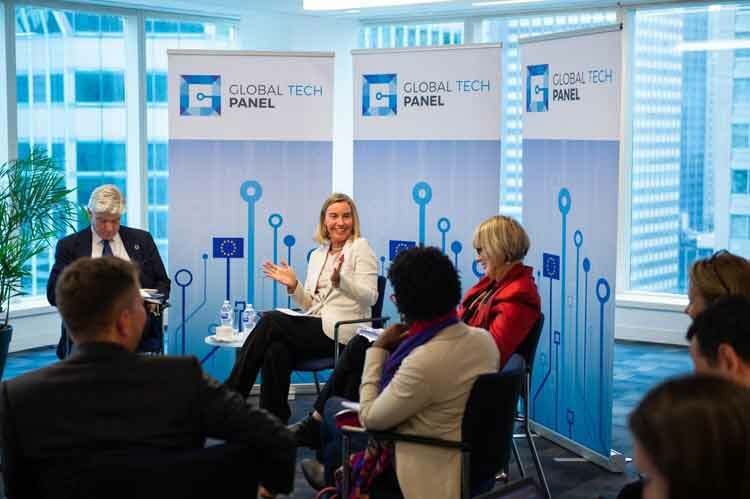 "Our discussions in the Global Tech Panel so far have strengthened my conviction that a new conversation is needed between diplomacy and technology leaders on solving problems together," said Federica Mogherini following the first meeting of the Global Tech Panel in Brussels in June 2018. "Whether it’s responding to climate change, global inequality, automation or new weapons, positive change requires a new, collaborative approach if we are to shift the dial back towards progress." Future frontiers in cyber security. The reflection and work of the panel members has advanced since then, leading to a series of new initiatives ripe for further discussion. 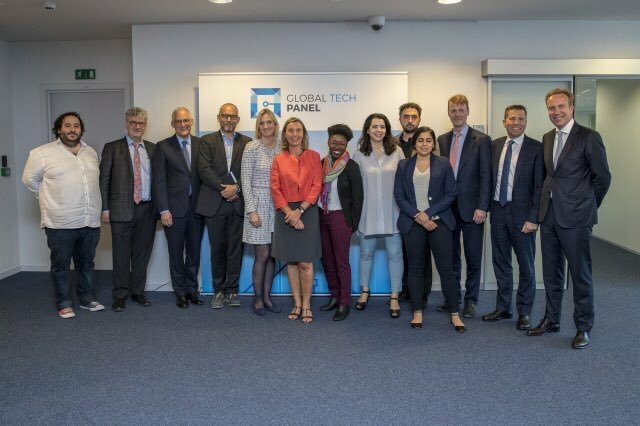 The Global Tech Panel members met again in New York on 25 September in the margins of the UN General Assembly. The New York meeting focused on initiatives to harness the opportunities of technology for human development. These include a concrete pilot project to link tech leaders, educators and governments to help build a 'digital generation' in Tunisia. 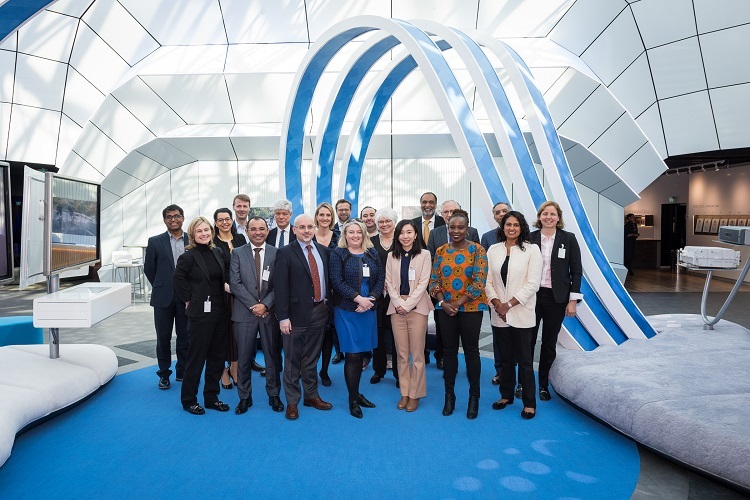 In 2019, the Global Tech Panel has met at Microsoft HQ in Seattle to focus on Lethal Autonomous Weapons and cyber security in March, and in April the Panel held a joint session together with their UN counterparts at Nokia HQ in Helsinki, ahead of the UN Panel's finalisation of its recommendations to the Secretary General. 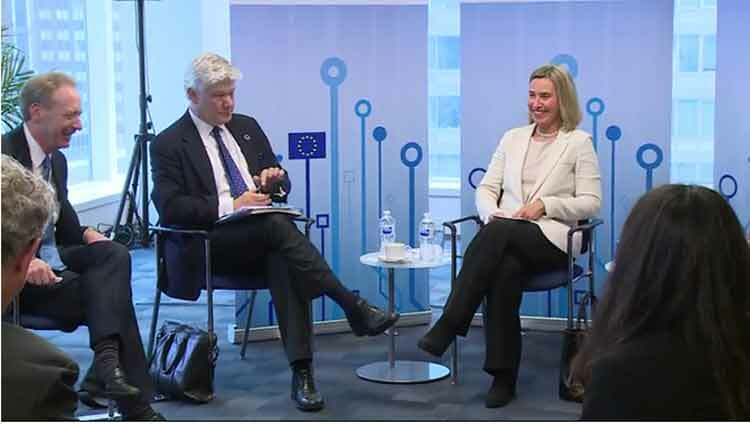 The GTP reflects the EU's commitment to effective multilateralism, or building partnerships at all levels and with a wide range of relevant players to promote peace and security, human development as well as democracy and human rights around the world. Oussama Ammar is Co-Founder at The Family. He has helped The Family’s portfolio companies to raise over €300M+ in the past four years, constantly pushing them to increase their ambitions in order to build the category-defining companies of the 21st century. He also uses his years of entrepreneurial and investing experience to educate audiences across the globe, giving talks and writing regularly about the realities of building startups and the future of the digital economy. BA, Norwegian Univ. of Science and Tech. Former: Minister of Foreign Affairs of Norway; Political Adviser to Conservative Party Chairman; Chairman, Young Conservatives; CFO, KB-entrepreneur; Member, Municipal Executive Board, Trondheim; Deputy Chairman, Norwegian Conservative Party; Member, Storting, Norwegian Parliament; Member, Standing Committee on Finance and Economic Affairs and Deputy Chairman, Standing Committee on Energy and Environment; Cabinet Minister of the Environment; Chairman, UN Commission on Sustainable Development; Cabinet Minister of Trade and Industry; Chairperson, PD Burma - Int’l Network of Parliamentarians promoting democracy; Secretary-General, Norwegian Red Cross; International Vice-Chairman, China Council for Int’l Cooperation on Environment and Development (advisory board to the State Council); Chairman of the Board, Mesta (Norway’s largest company in infrastructure maintenance); Managing Director, World Economic Forum. Since 2017, President, World Economic Forum. Member of the Board, Statoil. Recipient of awards and honours, including: Commander, Royal Norwegian Order of St Olav (2005); Cavaliere Di Gran Croce, Italy (2005); «Gift to the Earth», WWF (2004). Joy Buolamwini is a poet of code who uses art and research to illuminate the social implications of artificial intelligence. She founded the Algorithmic Justice League to fight the coded gaze -bias in AI. At the MIT Media Lab, she pioneered techniques that are now leading to increased transparency in the use of facial analysis technology globally. She leads the IEEE working group to create the first international standards for facial analysis technology. Her TED Talk on bias in AI has been viewed over 1 million times. As the inaugural Chief Technology Officer for Techturized Inc. and Swift Tech Solutions, Buolamwini led software development for underserved communities in the United States, Ethiopia, Mali, Nigeria and Niger. In Zambia, she explored empowering citizens with skills to create their own technology through the Zamrize Project. Buolamwini is a Rhodes Scholar, Fulbright Fellow, and Google Anita Borg Scholar. She holds master’s degrees from Oxford University and MIT and a bachelor’s degree in Computer Science from the Georgia Institute of Technology. She is pursuing a PhD at MIT focusing on participatory artificial intelligence. Ms. Solina CHAU serves as the Executive Director of the Li Ka Shing Foundation (www.lksf.org), a charitable organization established in 1980 by Mr. Li Ka-shing. The Li Ka Shing Foundation to date has donated over 20 Billion HK dollars (US $2.56b) to support reform initiatives in education and advancements in medical research and services. Apart from managing the Li Ka Shing Foundation, Ms. Chau founded Horizons Ventures HK Ltd (www.hvl.com.hk) in 2002 to identify investment opportunities to support technological solutions to some of the world’s most pressing challenges. Firmly believing in the world of technology and its “prescient value” to offer hope to the future, over the years, Horizons’ investments have spanned from artificial intelligence, reality computing to synthetic biology and health technologies, many of whose mission is to tackle and resolve the issues that propels the world to be better. In 1996, Ms. Chau also founded the H.S. CHAU Foundation (www.hschau.com) with a focus on strengthening education and women’s initiatives. To date, the H.S. CHAU Foundation has donated more than 1 Billion HK dollars towards various initiatives, from providing university scholarships for women seeking higher education, building primary schools and recreational sports grounds in China, to supporting a nationwide research-based science competition for high school seniors. Tom was the Foreign Policy Adviser to three British Prime Ministers (2007–11), and British Ambassador to Lebanon (2011–15). Now Visiting Professor of International Relations at NYU, Honorary Fellow of Oxford University, and Chairman of the International Advisory Council of the Creative Industries Federation, promoting Britain’s most dynamic and magnetic sector overseas. Tom also advises the Global Business Coalition for Education, which seeks to harness private sector efforts to get 75 million children into school. He has recently led a government review of British diplomacy, and chaired a report on the future of the UN. His book ’The Naked Diplomat - Power & Politics in the Digital Age’ was published in 2016. Tom is a co–founder of the Foundation For Opportunity, which supports good people doing good things in public life. Former co-CEO of SAP AG., Chairman A. P. Moller - Maersk (DK), Chairman Siemens AG (D) Vice Chairman Allianz SE (D). Member of the Board of Trustees at World Economic Forum (CH). Based on 25 years of experience in the IT industry Jim Hagemann Snabe is focused on leadership around innovation, digitization and societal progress. As co-CEO of SAP Jim was together with Bill McDermott instrumental in driving the strategic development of SAP to double the value of the company and play a more responsible role in society. In 2013 he and co-CEO Bill McDermott were ranked #2 on Glassdoor.com’s listing of the top fifty highest rated CEOs, based on their 99 percent approval rating from employees. In his capacity as a global business leader Jim is involved in a number of activities focused on societal progress and the role of business in society. Snabe’s views on leadership is shaped by his commitment to solving societal issues and his trust in human potential. Snabe received a master’s degree in operational research from the Aarhus School of Business in Denmark. In 2016 Jim was appointed Adjunct Professor at Copenhagen Business School based on his work around digital transformation and its impact on business and society. He lives with his family in Copenhagen, Denmark. Dr. Amel Karboul is a social entrepreneur, chairwoman, author and politician. She is passionate about nurturing a new generation of responsible leaders and building bridges between the private, public sector and civil society to solve today’s global challenges. Master’s with honors in Mechanical Engineering, Karlsruhe Institute of technology (KIT), Germany; Doctorate in Coaching and Mentoring, Oxford Brookes University, UK. Held leadership roles in Mercedes-Benz, DaimlerChrysler; senior consultant roles at the Boston Consulting Group (BCG), Beratergruppe Neuwaldegg and as Secretary-General of the Maghreb Economic Forum (MEF). Quickly became known as an award winning executive coach, published author and a trusted advisor for CEO’s of global organizations as well as family owned businesses and entrepreneurs. Visiting professor at DukeCE; member of the Global Diplomacy Lab; advisory board member of CLP, WTFL and GBCEd. She was until Feb 2015 Minister of Tourism in the Tunisian transition government that has been appointed after the successful quartet negotiations (Nobel Peace Prize Winners 2015) and nominated as one of 10 leading young African politicians. She published her book Coffin Corner; outlining a new leadership culture suited to the complexity and dynamics of the 21st century! Cassandra has held executive and leadership roles in large multinationals in various countries and has founded businesses in financial services and technology. She co-founded multiple award-winning Pottinger, bringing together strategy, policy, M&A and data analytics. At Pottinger, she trade-marked Destination Led Strategy. She stepped aside as CEO and Chair and remains a senior advisor. Cassandra derives satisfaction from the advisory and speaking engagements which allow her to work with political and corporate global leaders who dare to lead and relinquish the status quo. She is an advisor to the G20/B20 process focused on digitalization, is an Expert International Advisor to their One Belt One Road initiative and works with The Brookings Institution as a member of the leadership council for the Center for Universal Education. Cassandra founded the influential diversity initiative, The Glass Elevator. She has personally supported the development of hundreds of senior executives in Australia. Dr Nicklas Berild Lundblad joined Google in 2007, first building the public policy team in the Nordics before being recruited to build a long term policy research and strategy team in Mountain View. He spent three and a half years in Mountain View building and leading this team after which he returned to Sweden in 2013 to take on the role as head of Google’s EMEA public policy team. He has represented Google at the G7, European Internet Forum and Global Internet Forum to Counter Terrorism. Nicklas holds a PhD in informatics, and is an adjunct professor in innovation at The Royal Institute of Technology in Stockholm. He is a member of the Royal Academy of Engineering Sciences in Sweden, an Eisenhower Fellow and has served on a number of boards. In 2012 he was one of 21 Google executives globally given a Great Manager Award. He is the author of three books on information technology and policy, and is a regular contributor to several newspapers and magazines. Risto Siilasmaa is the Chairman of the Board of Directors of Nokia Corporation. [www.nokia.com/en_int]. He joined the Nokia Board in 2008 and became Chairman of the Board in May 2012. As Chairman he led Nokia through its transformation from an ailing devices company to a successful network infrastructure player through the divestiture of the Nokia device business to Microsoft and the acquisition of Nokia Siemens Networks and the acquisition of Alcatel-Lucent. Mr Siilasmaa is the founder of F-Secure Corporation [www.f-secure.com/en/welcome], a Finnish cybersecurity company and served as the President and CEO of the company between 1988-2006. Since then he has held the position of Chairman of the Board of Directors. Mr Siilasmaa is a member of the Board of Directors of Futurice Corporation, the Vice Chairman of the Board of Directors of the Confederation of Finnish Industries, Chairman of the Technology Industries of Finland and a member of the European Round Table ERT. He is also a member of Tsinghua SEM Advisory Board, International Business Leaders Advisory Council for the Mayor of Beijing and High-level Advisory Council of the World Internet Conference (Wuzhen Summit). In addition Mr Siilasmaa is the Finnish Chairman of the recently established China-Finland Committee for Innovative Business Cooperation. Mr. Siilasmaa has received several awards including Nordic Chairman of the year 2009, the Most Influential IT Leader 2007, The Leader of the Decade 2003 and Innovation Luminary Award 2015 granted by EU Open Innovation Strategy and Policy Group. Mr. Siilasmaa holds a Master of Science degree from the Helsinki University of Technology and he was awarded Honorary Doctorate in Technology by Aalto University schools of technology in 2018. Emery Simon is Global Vice President for Government and Regulatory Relations at Spotify. He is responsible for managing Spotify interactions with governments around the world on initiatives that affect Spotify’s core business strategies, including privacy, security, competition, tax, entry into new markets and social impact. Before joining Spotify, Emery has had diverse experience in business and government working in over 70 countries in the America’s, Europe and Asia. He has advised and represented the leading software companies for over two decades on a broad range of U.S. and international policy issues including intellectual property, technology policy, trade and security. 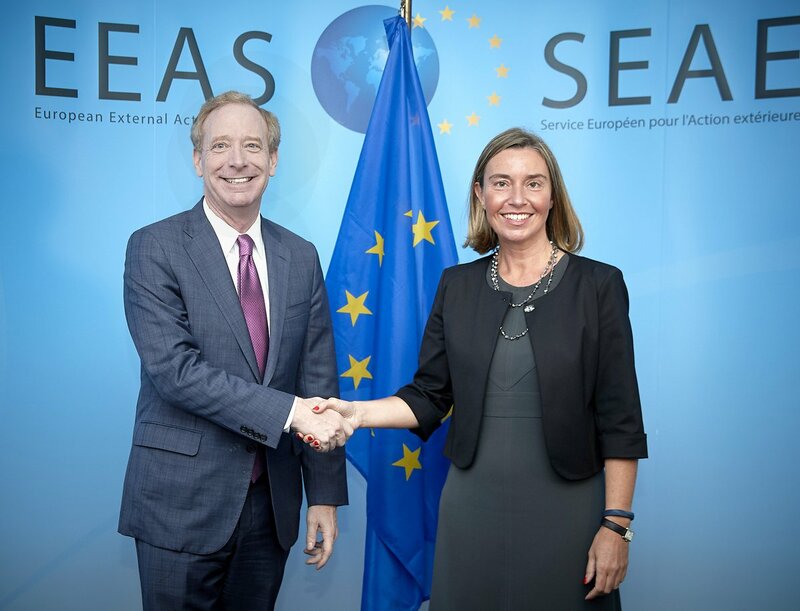 Previously, Emery was the lead United States government negotiator on technology and intellectual property at the World Trade Organizations, in the North American Free Trade Agreement and in over sixty bilateral agreements. He also spent many years working for the U.S. Congress on foreign aid issues, at the Inter-American Development Bank and the Council on Environmental Quality. Emery has a law degree from Georgetown University, a master’s degree in international affairs from the Johns Hopkins University School of Advanced International Studies, and a bachelor’s degree in economics from Queens College. Brad Smith is Microsoft’s president, chief legal officer, and chief compliance officer. Smith plays a key role in representing the company externally and in leading the company’s work on a number of critical issues including privacy, security, accessibility, environmental sustainability and digital inclusion, among others. Since joining Microsoft in 1993, Smith has overseen numerous negotiations leading to competition law and intellectual property agreements with governments around the world and with companies across the IT sector. He has played a leading role within Microsoft and in the IT sector on government surveillance, privacy, intellectual property, immigration and computer science education policy issues. In 2013 he was named by the National Law Journal as one of the 100 most influential lawyers in the United States. In March 2015, Smith joined the Netflix board of directors. He also works to advance several significant diversity and pro bono initiatives, serving as chair of the board of directors of Kids in Need of Defense (KIND) and as chair of the Leadership Council on Legal Diversity (LCLD). 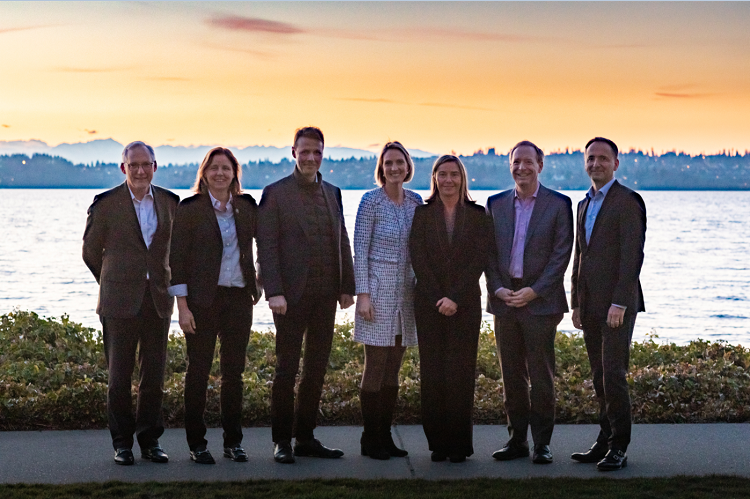 In addition, Smith chairs the board of the Washington State Opportunity Scholarship program. Smith earned his J.D. from the Columbia University and studied international law and economics at the Graduate Institute of International Studies in Geneva, Switzerland. As the third U.S. chief technology officer (2014-2017), Megan Smith helped President Obama and his teams harness the power of data, innovation and technology on behalf of the nation. Smith recruited top tech talent to serve across government and to collaborate on the most pressing issues of the day, from data science, AI and open source, to inclusive economic growth and criminal justice reform. She focused on broad capacity building by co-creating all-hands-on-deck initiatives, including the public-private program TechHire, the Computer Science for All initiative, and the Image of STEM campaign. Prior to her role as U.S. CTO, Smith served as vice president of new business development at Google, managing early-stage partnerships across the company’s global engineering and product teams. She led acquisitions of Google Earth, Maps, and Picasa, steered the shift of Google.org to include more direct engineering impact, such as Google Crisis Response, and later served on the leadership team of GoogleX, where she co-created SolveForX and Women Techmakers. Earlier, Smith was CEO of PlanetOut and pioneered early smartphones technologies at General Magic. Mustafa Suleyman is co-founder andHead of Applied AI at DeepMind, where he is responsible for integrating the company’s technology across a wide range of Google products. In February 2016 he launched DeepMind Health, which builds clinician-led, patient-centered technology in the NHS. Mustafa was Chief Product Officer at DeepMind Technologies, before the company was bought in 2014 by Google in their largest European acquisition to date. DeepMind was a leading AI company backed by Founders Fund, Li Ka-Shing, Elon Musk, and David Bonderman amongst others. At 19, Mustafa dropped out of Oxford University to help set up a telephone counselling service, building it to become one of the largest mental health support services of its kind in the UK, and then worked as policy officer for then Mayor of London, Ken Livingstone. He went on to help start Reos Partners, a consultancy with eight offices across four continents specializing in designing and facilitating large-scale multi-stakeholder ‘Change Labs’ aimed at navigating complex problems. As a skilled negotiator and facilitator Mustafa has worked all over the world for a wide range of clients such as the UN, the Dutch Government and WWF.